The state of Victoria, Australia, has long been a site of tension between an incumbent and powerful road lobby and a community increasingly desirous of non-car transport alternatives. Today there is no greater signifier of this than the East West Link, a proposed 18km motorway in Melbourne estimated to cost $16 billion. The project is unprecedented both in the haste with which it is being pushed through the planning and pre-construction stages, and the apparent determination of the State Government not to seek any kind of public mandate for the project at a State election. Yet the project has no conventional benefit-cost justification, does not serve a clearly defined demand in the context of Melbourne’s travel patterns and trends, and is likely to displace better-justified and more popular public transport projects for many years. Last year, it was the subject of Paul Mees’ final public addresses before his untimely death. This article examines the historical background to the East West Link, the arguments put forward for it, and the alternatives that have featured in the ensuing public debate. Keywords: Motorways, Melbourne, Transport economics, Transport modelling, Agglomeration benefits, Cost-benefit analysis, Downs-Thompson paradox, predict and provide. Originally published in Eco-Logica: World Transport Policy and Practice Volume 20.2/3 May 2014 and republished with permission by Dr Anthony Morton, President, Public Transport Users Association, Melbourne and Professor John Whitelegg, Stockholm Environment Institute at York, University Of York, UK. Like much of the English-speaking world, the state of Victoria, Australia, has long been a site of tension between an incumbent and powerful road lobby and a community increasingly desirous of non-car transport alternatives (Mees, 2000 and Stone, 2008). Today there is no greater signifier of this than the East West Link: a proposed 18km motorway in Melbourne, running from east to west through the inner northern and western suburbs (www.linkingmelbourne.vic.gov.au). 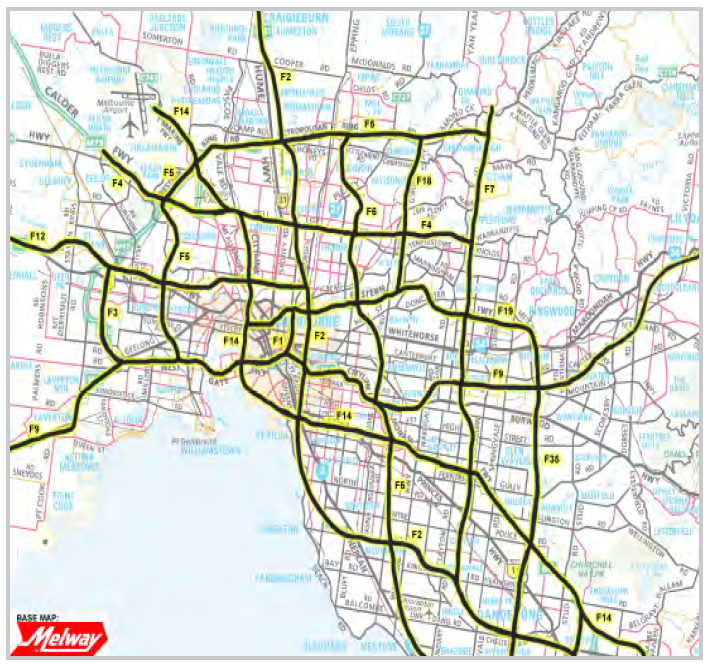 Its eastern section would run for 5km through the inner north and pass within 3km of Melbourne’s Central Business District, and connect the existing Eastern Freeway at the eastern end with the CityLink tollway to the west. This eastern section alone has a current budget cost of $8 billion. The project’s western section would continue a further 13km through the inner west and connect ultimately with the Western Ring Road in Melbourne’s western industrial zone, raising the total project cost to an estimated $16 billion. While it has been the subject of numerous studies over the years, it was only in 2012 that the Victorian Liberal/National Coalition Government announced its intention to undertake the necessary planning and commence construction, initially for the most contentious eastern section. The project is unprecedented, both in the haste with which it is being pushed through the planning and pre-construction stages, and the apparent determination of the State Government not to seek any kind of public mandate for the project at a State election. At the previous election in 2010, the Coalition had replaced an incumbent Labor Government on promises to build suburban rail extensions and reform the management of public transport. Curiously, it was Labor and not the Coalition who were making explicit promises on roads, and then only for a more modest 5km version of the project’s western section, and a second motorway in the north-eastern suburbs (VIctorian Government, 2008). Far from the Coalition Government having an electoral mandate to build the East West Link, the 2010 election result would appear to imply the opposite. Perhaps with this in mind, the government has now made clear that its haste in progressing the planning for the road is aimed at obtaining signed contracts for construction prior to the November 2014 State election, thus binding any subsequently elected government (Tomazin, 2013). The road has been variously defended by its supporters, from the Victorian Premier down, as a ‘congestion buster’, a ‘game changer’ and a ‘city shaping’ project. The government agency responsible for the project, the Linking Melbourne Authority (LMA), began its evidence to the East West Link panel hearings on 3 March by handing around copies of Edward Glaeser’s book Triumph of the City. This may seem an odd choice given that Glaeser is no defender of motorway building, particularly in the central areas of established cities. But we might understand this better if we recall that Glaeser’s book is intended as an apologia for the economic, social and environmental benefits of concentrating human populations within large, high-density urban areas—even, or perhaps especially, where this comes at the expense of existing low-rise built forms (Glaeser, 2012). LMA’s business case for the East West Link relies critically on ‘agglomeration benefits’ of this kind. It is perhaps hoped that Glaeser’s pro-development, deregulationist stance, and his defence of ‘urban megaprojects’ in particular, will obscure the fact that there is scant evidence that big road projects actually promote urban concentration, and ample evidence that they do the opposite, promoting the sprawl and hollowing-out of urban areas that Glaeser warns against. It has always been clear that without these crucial ‘agglomeration benefits’ the East West Link is on very shaky ground financially. All published assessments of the East West Link to date have indicated that on conventional cost-benefit criteria, the project will fail to generate benefits sufficient to cover the sizeable cost of construction. Paul Mees, prior to his untimely death in 2013, repeatedly made the point that the failure to produce a positive benefit-cost ratio should have ruled the project out immediately. Infrastructure Australia, the arms-length Federal Government agency that recommends projects for Federal funding, has for its own part never rated the East West Link higher than the ‘Real Potential’ category, the second of four steps required to fulfil its funding criteria (Infrastructure Australia, 2013). Meanwhile a competing rail project—the Melbourne Metro Tunnel Stage 1—had been assessed in the fourth category ‘Ready To Proceed’ in 2011, with a conventional benefit-cost ratio of 1.3 (Infrastructure Australia, 2011). If this road project lacks a conventional benefit-cost justification and is unlikely to produce ‘agglomeration benefits’ of the sort claimed for it, then perhaps there are some other intangible benefits that might justify why this project is being prioritised ahead of all other transport investment in the state of Victoria. As this article will explain, this is highly unlikely when one considers in detail the claims made, the evidence, and the measures that have been put forward as alternatives in the political debate around this project—measures that Victorians will be unable to afford in future as a consequence of the government’s commitment to the road. As Paul Mees might say, the East West Link could be the greatest political folly Victoria has yet seen. Or as H. L. Mencken put it decades ago, “there is always a well-known solution to every human problem—neat, plausible, and wrong” (Mencken, 1917). Like almost every other major road proposed for Melbourne, the East West Link project has its roots in the Melbourne Transportation Study of 1969. This major planning study was postwar Melbourne’s bid at emulating the ambitious American highway plans of the era, and the authorities made a point of engaging for the task the firm of Wilbur Smith and Associates, who had taken the lead in developing such plans ever since producing the first of its kind, the influential Chicago Area Transportation Study of 1956. In city after city where this computer-driven ‘systems approach’ had been carried out, the primary study outcome always appeared much the same: a grid of freeways cutting across the urban area, typically with about a five-mile spacing (Mees, 2000). Melbourne’s own study likewise proposed a grid comprising well over a dozen freeways with a total length around 500km spread across the entire metropolitan area, with an overall scale and route length similar to that of Los Angeles’ well known freeway system. This grid has, with minor modifications, served as the template for major road proposals in Melbourne ever since. [The study is] an unconvincing work presented with all the glib political clichés that one has learned to distrust. It is based on the earlier American transportation study techniques, by now thoroughly discredited…quite clearly it is a road plan, not—as it is called—a comprehensive transport plan. Victorian Premier Rupert Hamer responded in due course to this criticism, excising large parts of the freeway plan the day before announcing an election in 1973 (which the government subsequently won comfortably). One of those roads removed in 1973 was the inner-city section of a freeway identified as the F19. The remainder, known as the Eastern Freeway, proceeded to be built in stages and now extends through much of Melbourne’s eastern suburbs. Since 2007 it has also connected to another motorway (originally labelled the F35 in the 1969 plan, and now known as EastLink) which proceeds due south and attracts traffic from a large part of Melbourne’s south-east. This has expanded the Eastern Freeway’s role beyond that of a traffic feeder for the eastern suburbs, so that it serves also as an alternative route from the south-east to the city, bypassing the heavily trafficked motorway that has served that purpose since the 1980s (the Monash Freeway). These progressive extensions of the Eastern Freeway to the east and south proceeded over decades despite planners’ knowledge that the freeway had a deliberately-created ‘dead end’ in the inner suburb of Clifton Hill, about 5km from the centre of Melbourne. Until the beginning of this century there were actually four such ‘dead ends’ where radial motorways met the inner city, similar to those still found in London and other European cities. As in those cities, Melbourne’s freeway dead-ends came about in recognition of the fact that these roads exist primarily to carry commuters into the city centre, and the central city area has a limited capacity to absorb the resulting traffic. By ‘metering’ the flow of traffic on approach routes, these dead-ends helped prevent inner-city streets becoming completely overwhelmed with traffic, kept demand for car commuting at a level that city streets could accommodate, and allowed public transport to demonstrate its ‘natural advantage’ in conveying large numbers of people to and from the city centre. This all changed when in the late 1990s the Victorian Government built the CityLink motorway. This joined together three of the four dead-ends, to the south and west of the city centre, resuscitating two other inner-city roads excised by Hamer two decades earlier. This was done on the rationale that a ‘bypass’ route was required for traffic proceeding from one side of the city to the other. Yet as traffic data showed at the time, and as remains true to the present day, the vast majority of traffic on the three radial motorways joined up by CityLink has its origin or destination in the city centre. Six years after the road opened, Melbourne’s Age newspaper reported on traffic studies that showed only 10% of traffic from the south-eastern suburbs used the CityLink route to bypass the city, and only 12% of traffic from the West Gate Bridge to the west used CityLink to cross over to the east (Colebatch, 2006). Even before CityLink opened in 2000, political momentum was building to ‘do something’ about the one remaining inner-city dead end, at the Eastern Freeway in Clifton Hill. This was always going to be politically contentious, however, because (unlike with CityLink) there is no convenient creek valley or industrial corridor for a new road to follow: the route consists entirely of homes and highly valued parkland. So from the time the first feasibility study was initiated in 1999, the road extension was always referred to as a ‘tunnel’—the subtext being that it would be invisible and therefore impose no social or environmental costs to set against its presumed benefits. The 1999 feasibility study was recast after a change of government, and became the Northern Central City Corridor Study (NCCCS), which appeared in draft form in 2003. This study was notable in that it examined the evidence for travel time and other benefits from the road, and based its conclusions on the evidence rather than any prior conviction on the project’s merits. Its key finding was that of all the daily westbound traffic coming off the Eastern Freeway, only 15% continued due west to CityLink or beyond. The majority (about two-thirds) turned south and headed toward the city, matching the long-established pattern observed on Melbourne’s radial freeways. The draft NCCCS accordingly concluded that no case could be made for extending the Eastern Freeway further west, because all this would achieve would be to take the existing ‘bottleneck’ in Clifton Hill and redistribute it to other northern approaches to the city, without significantly reducing the amount of traffic subject to congestion. In its place, it recommended a suite of local traffic management measures to boost the efficiency of traffic flow on the inner-city road network. As it happens, the NCCCS never proceeded to a final report: for reasons that remain unclear, the study was shut down after the draft report appeared. The contract for the EastLink motorway was awarded one year later in 2004, and this coincided with the appearance in the media of stories about the masses of traffic EastLink would add to the city end of the Eastern Freeway. Then in 2005 came Melbourne City Council’s ‘East West Integrated Transport Proposal’. This resuscitated the Eastern Freeway extension in the form we know it today, including the additional 13km section through the western suburbs. It was now suggested this western section was required as an ‘alternative’ to the congested West Gate Bridge, the principal freeway route from the west. Notwithstanding the negative conclusion from the NCCCS study just two or three years previously, the State Government promptly took up the cause, commissioning in 2006 the East West Link Needs Assessment, more commonly known as the Eddington Report (Eddington, 2008). Sir Rod Eddington came to the East West Link Needs Assessment fresh from preparing the Case for Action report for the UK Government (Eddington, 2006). A key theme in that earlier report was emphasising the wider economic benefits that are held to flow from public investment in roads, rail and airports, and a similar emphasis underlay the recommendations of the 2008 Eddington Report for Melbourne. The LMA case for the East West Link draws heavily on the Eddington Report’s themes of ‘transport connectivity’ and ‘agglomeration benefits’—themes that now also find their echo in Glaeser’s work. The East West Link was one of three big-ticket projects recommended by Eddington. Another was the Regional Rail Link, a new rail alignment from the west of Melbourne into the city that regional trains could use to bypass the suburban rail network. This ‘Tarneit link’ was not a major focus of the report, but famously gained $3.2 billion of Commonwealth funding as a ‘shovel ready’ economic stimulus project in the wake of the Global Financial Crisis in 2009, despite not being far developed beyond a line on a map at the time (Murphy, 2011). The third major project was the 9km Melbourne Metro rail tunnel, providing an extra suburban train path under the city centre between the inner western and south-eastern suburbs. As previously mentioned, planning for this project was sufficiently well advanced by 2011 that Infrastructure Australia considered it ‘Ready to Proceed’. Both the Regional Rail Link and the Melbourne Metro tunnel have been criticised by public transport advocates, most notably by Mees, on the basis of high budget costs, inconsistent justifications, flawed design, ‘mission creep’, and a general failure to weigh up the projects against potentially less costly alternatives (Mees, 2008a/b). These objections notwithstanding, the Eddington Report and subsequent assessments by bodies such as Infrastructure Australia have consistently given these projects both a higher benefit-cost ratio and a lower overall cost than the East West Link motorway. It was accordingly not these assessments the Victorian Coalition Government was relying on when it seized on the motorway as its highest transport infrastructure priority. The positive claims made for the East West Link that call for scrutiny are numerous. For the reader’s benefit, the various claims are investigated below in four broad categories: economic benefits and cost savings; travel patterns and trends; the adequacy of the road network and role of non-road alternatives; and job creation. Transport projects are conventionally subjected to a cost-benefit analysis where the costs of construction, land acquisition and associated severance are weighed up against aggregate travel time savings and other ‘cash’ benefits such as reduced road trauma costs, vehicle operating cost savings and additional public transport revenue. Travel time is usually by far the largest benefit assessed. Reliance of this metric can be justified on the basis that on a strict view, the objective of transport systems is to promote mobility of the population by increasing the range of destinations accessible in a given time from one’s starting point. This strict rationale is invoked, for example, when planners gauge the productivity of the transport system by tallying the number of jobs accessible within half an hour’s travel time from various points in the urban area (Victorian Government, 2002, p.24). The travel time metric is also vulnerable to criticism, most palpably on the questions of how one assigns a dollar value to time savings, and whether a one-minute saving for each of 10 people should really be valued identically to a ten-minute saving for one person. It nonetheless remains the best tool available for quantifying the mobility benefit of a transport system improvement. It also provides a reasonably reliable tool for comparing alternative proposals from a mobility perspective. It is nonetheless true that all conventional benefit-cost ratios ever published for the East West Link as a standalone project have been less than unity; that is, the conventionally assessed benefits have failed to match the cost of construction, indicating the project is wasteful of public funds. Conversely, when major public transport projects such as the Melbourne Metro tunnel have been assessed on the same basis, the benefit-cost ratio (BCR) calculated has been equal to 1 or greater. The fiscal weakness of the East West Link was not directly apparent from the Eddington Report, because the costs and benefits were stated for the complete package of road and public transport improvements, and not for the road project alone. However, the consultants’ supporting analysis (Meyrick et al, 2008) also provided cost and benefit estimates for the public transport improvements considered alone. As Mees (2008b) pointed out, the figures imply by simple subtraction that the conventional BCR for the road is 0.45, indicating a return to the public of just 45 cents worth of benefit for every dollar spent (see Table 1). In order to provide a convincing justification for the measures in the Eddington Report, it was necessary to rely on ‘wider economic benefits’ additional to the travel time and cost savings considered in a conventional analysis. But even when these wider benefits were included, they failed to make a break-even case for the road: a calculation similar to the above found the BCR for the road increased to just 0.74 (Mees, 2008b). The current State Government has made much of having an updated ‘business case’ for the East West Link that computes a more respectable BCR of 1.4 including ‘wider economic benefits’. But this was only made public as a ‘short form’ 8-page summary document, which confirmed that the construction cost had been reassessed as $8 billion for the eastern section (compared with Eddington’s $7 billion for the entire project), but provided no other supporting detail. Only when an Infrastructure Australia official was called before a Federal Senate committee was it publicly confirmed that without including the wider benefits, the BCR of the road was still only 0.8—a return of 80 cents per dollar spent (Gordon, 2014). The ‘wider benefits’ spoken of for the East West Link are, for the most part, Glaeser’s ‘agglomeration benefits’. They rely on the ability of improved transport systems to concentrate employment and activities in urban centres. The problem is, of course, that the building of urban motorways is not generally held to promote urban concentration at all. The supporters and opponents of road-building are generally agreed that the effect of building more roads is to de-concentrate urban activities: to put more distance between destinations and promote sprawl, as development relocates to far-flung locations dependent on private car transport. Even where urban areas that have built motorways do achieve beneficial concentration of activities, this concentration cannot be said to have been caused by motorway building; at best, the motorways have a neutral influence on the concentrated urban form brought about by other means. As long as the full business case for the East West Link remains shrouded in secrecy, therefore, there are substantial grounds to doubt that the ‘wider benefits’ claimed for the road have a basis in reality. And since the project is wholly reliant on these ‘wider benefits’ to have a chance of returning a public benefit greater than the cost of construction, this should call into question the entire economic justification for the road. The only way the case for the road might be salvaged is if the cost to the public of building the road were somehow reduced to become less than the quantum of benefit. Accordingly supporters of the road have emphasised the way it is being proposed as a ‘public-private partnership’ (PPP) and that the State and Federal Governments have so far only committed $1.5 billion apiece toward the $8 billion eastern section. The implication is that the $5 billion balance will be funded by the private sector at zero cost to the public. But this, to put it mildly, is not how PPPs have worked in the past. Private-sector partners, understandably, are even more anxious than governments to obtain a commercial return on investment; they have learned from high-profile failures of similar toll road operations such as Sydney’s Cross City Tunnel. But this financial return does not come out of nowhere: it comes either from the users of the road via tolls, or from the government via availability payments or ‘shadow tolls’. Either way, there is a transfer of money from the public as road users or taxpayers to support the private operator, representing once again costs to be offset against travel time savings and other benefits. Either way, the public still pays the full cost of the road. The one advantage of PPPs—or indeed of direct public borrowing to fund projects—is that the upfront cost of construction is restructured as a stream of future cash flows that can be discounted (as indeed the benefits must also be discounted as they lie in the future). It appears unlikely, however, that a prima facie public deficit could be parlayed into a substantial public surplus purely through accounting devices of this kind. It appears particularly unlikely given that long-term observers of PPP projects in Victoria have concluded they can at least double the ultimate cost to the public compared with ordinary deficit financing (Davidson, 2013). Economic arguments for the East West Link all rely on assuming the road actually does generate the travel time savings claimed for it. But in the real world, travel time savings from new urban motorways have been challenged on two grounds: first, that induced travel soon appears to cancel out any time savings gained (SACTRA, 1994); and second, that the motorway ‘solution’ does not even fit the problem planners are trying to solve. [T]hese results suggest that… an increase in average travel speeds has not eventuated in Melbourne’s urban road network during the years under review. Indeed, based on the evidence presented and analysed in this paper, one could be led to the conclusion that investments in Melbourne’s urban road network have resulted in more time being used by Melbourne’s motorists rather than less time. On the basis of the assumptions conventionally used to justify road building, major road infrastructure initiatives have resulted in net economic disbenefits… In closing, perhaps the German word schlimmbesserung—meaning an improvement that makes things worse—is an apt descriptor for the massive program of new road construction that has marked Melbourne’s solution to its transport challenges over the last several decades. But quite apart from induced traffic is the question whether the East West Link is actually fit-for-purpose. Like CityLink, it is claimed to be a ‘bypass’ of the inner city to allow faster travel between the eastern and western suburbs. Psychologically, this argument appeals to the ‘availability cascade’ produced by the long queue that regularly forms at the city end of the Eastern Freeway. The fact this queue points due west, and not toward the city centre where most traffic is headed, actually undermines our rational capacity to apprehend the true traffic patterns in the area, a task that demands ‘slow’ or ‘system 2’ thinking (Kahneman, 2011). The idea we are intuitively led to accept instead is that by joining up all the motorways we can confine all the traffic there, and banish all congestion from our arterial roads and residential streets. Of course, with our system 2 thinking engaged, we know that travellers’ final destinations are not on motorways, and we can recall the NCCCS conclusion that true east-west travel only accounts for 15% of traffic coming off the Eastern Freeway and that the freeway’s primary role is as a radial commuter route to the city centre. It is unfortunate therefore that road planners have attempted to obscure this conclusion in order to justify the East West Link project. One way this has been done is using the concept of ‘select link analysis’, many examples of which are given in Chapter 5 of the Eddington Report. The technique is to choose a single point X on the road network, and then map all the (actual or modelled) journeys that pass by X. The result is a map with lines of varying thickness, thicker lines indicating a larger share of the journeys through X. Particular attention is drawn to an analysis for Brunswick Road, which runs parallel to the route of the East West Link. The map extends two quite thick lines to the east and west, one onto CityLink and the other toward the Eastern Freeway. Again the clear intention is to suggest a dominant pattern of long-distance east-west travel using Brunswick Road as a ‘rat run’ between these two motorways (Eddington 2008, chapter 5, pp.123–4). It is suggested the East West Link would absorb this travel, removing it from the local road network. What is not explicitly pointed out here is that the travel pattern shown is not obtained from real travel surveys, but is actually the output of a computer model—a more sophisticated version of the one Wilbur Smith used in the 1960s. Though the model is validated at a coarse level against real traffic data, such an exercise can only validate the aggregate numbers: it cannot validate the pattern of origins and destinations among individual journeys, unless the real-world data includes origin-destination or number plate surveys (like those undertaken for the NCCCS), and not just vehicle counts. This means the patterns seen will be entirely a function of the assumptions programmed into the model. Brunswick Road is a local arterial road. It will therefore cater for a sizeable amount of local travel as well as feeding traffic to major routes such as CityLink or the Eastern Freeway. While some Brunswick Road traffic will be seen to travel to CityLink and some traffic will be seen to travel to the Eastern Freeway, it is most likely that, in nearly all cases, this is not the same traffic. For the most part it will be journeys that commence in the suburbs adjoining Brunswick Road itself and head to one of these motorways, or vice versa. The East West Link does not provide an alternative route for such journeys, as it is intended as a cross-city route with few intermediate entry or exit points. What this all means is that when modelling by East West Link proponents appears to find evidence of large-scale rat running through suburban streets, all they are seeing is their own model’s assumptions reflected back in the results. The model has in effect taken some limited observations of local travel within these suburbs and hypothesised patterns of long-distance travel that are consistent with these observations. It repeats the key misapprehension in the case for the EastLink motorway, when congestion on north-south roads in eastern Melbourne was taken as evidence of large amounts of long-distance north-south travel, when in fact it arises from the combined effect of many short-distance local trips (PTUA, 1998). Also overlooked in the traffic forecasts underlying the case for the East West Link is the fact that the long 20th-century trend for car travel to grow faster than population has actually ceased in much of the western world. Indeed in some cities including Melbourne, car travel per capita has been on a very slight declining trend since about 2004 (Loader, 2013). One way this has been seen to play out is in the daily traffic statistics for the very east-west roads in Melbourne that are said to be grinding to a halt. As Table 2 shows, many of these roads have seen daily traffic decline by as much as 15% over the decade 2002–2012, and even those whose traffic has increased have seen these increases limited to at most 5% over that time. On their face, these statistics do not indicate an urgent problem that is only capable of being solved by a new road. Rather they suggest road traffic in the region is being managed broadly in line with the recommendations of the 2003 draft NCCCS report. It contrasts with the arterial roads parallel to CityLink, where motorists have seen the playing out of Odgers’ conclusion above, of rising local congestion and travel time dis-savings. When combined with the reality of induced traffic, ‘predict and provide’ is self-evidently a policy with perverse consequences. In such a world, new roads provide their own post hoc justification through increased traffic levels (as CityLink did between 2000 and 2004), which in turn support new predictions mandating the provision of further new roads. 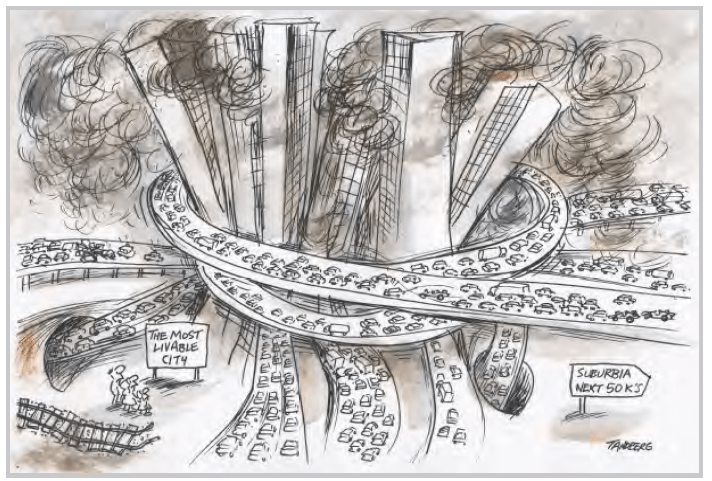 It has been recognised that to break this vicious cycle, planners must consciously resist the temptation to encourage traffic growth by adding to road capacity in already-congested urban areas. It is especially critical that in those places where a declining trend has established itself—as appears to be the case in inner-northern Melbourne to date—they do not undermine this with contrary policies, based on recycled forecasts of rising traffic that do not reference the facts on the ground. The above feeds into general arguments about the future capacity of Melbourne’s road network, its ability to cope with population growth and the demands of freight transport, and the role of public transport in relieving demands on the road system. 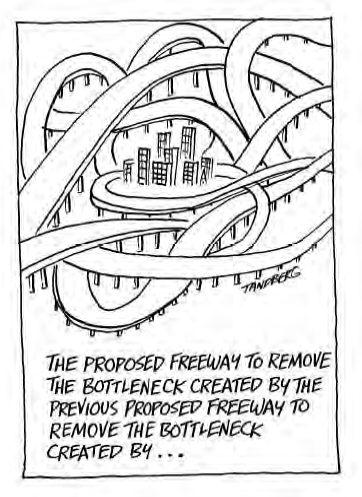 The most popular argument for the western section of the East West Link is the supposed need for an “alternative to the West Gate Bridge” (Victorian Government, 2008). It is frequently suggested that the East West Link would provide ‘backup’ in the event that an incident closes an existing motorway route. If history is any guide, however, the East West Link will soon enough fill up with its own traffic that will all but prevent it from assuming the additional load diverted from another motorway. It would only reliably function as ‘backup’ if it were kept closed to traffic until such time as an incident occurred. Meanwhile, there are actually three major arterial roads to the immediate west of central Melbourne that run parallel to the West Gate Bridge and provide motorists with an alternative right now—a total of six lanes in each direction. The Western Ring Road performs a similar function, but runs further north, requiring motorists to approach the inner area on CityLink and pay a toll (whereas the West Gate Bridge is toll-free). And that is just on the road network. The western section of the rail network comprises four suburban railway tracks, two freight tracks, and two tracks recently built as part of the Regional Rail Link project. On a conservative estimate these tracks carry some 16,000 passengers in the peak direction in the busiest hour, which is twice as many as drive or are driven over the West Gate Bridge in the same hour. The completion of the Regional Rail Link in 2015 is expected to add capacity to this part of the rail network equivalent to a whole additional West Gate Bridge, with 8,000 or more additional passengers able to be carried. Should the Melbourne Metro tunnel ever be built, one can expect yet another capacity boost of the same magnitude. So in reality there are ample ‘alternatives’ to the West Gate Bridge for passenger transport. The failure to recognise this in the policy debate appears to be down to the unwillingness of politicians and senior planners to learn from the turnaround in public transport use in Melbourne over the past decade. 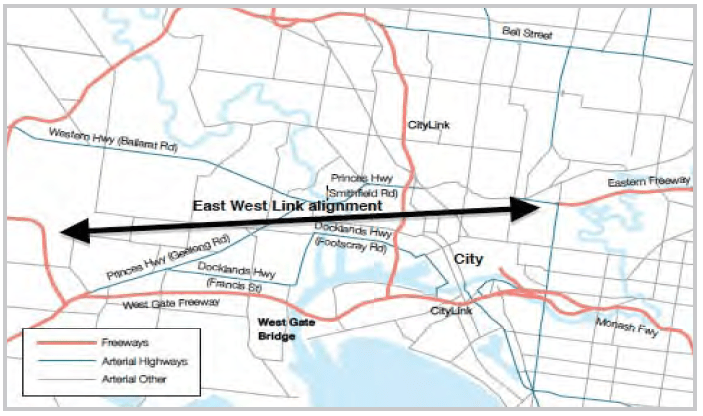 In a panel hearing on 5 March 2014, LMA’s chief modeller Michael Veitch remarked that people in the East West Link catchment “are not users of public transport”. This commits what social psychologists call the ‘fundamental attribution error’—attributing people’s behaviour to the kind of people they are rather than the circumstances in which they find themselves—which is an all too common fallacy in transport planning (Druker, 2010). The fundamental attribution error is also at the root of the frequent calls for ‘balance’ in transport planning. This is exemplified by the insistence in the Eddington Report, frequently repeated in newspaper editorials, that the solution to Melbourne’s transport problems lies in building big road projects alongside big rail projects. In reality, what this actually entails is building a rail project with a positive return on investment, but then undermining that benefit by building a parallel road project whose own benefits fall short of its costs but which will compete with the rail project for passengers, starving both projects of revenue. In reality, people adjust their use of cars and public transport according to the quality of service available. This was first recognised by the economist Anthony Downs and was developed by Thomson into the assertion known as the Downs–Thomson Paradox: that the level of service on the road system can depend more on the quality of the alternatives to road travel than on the quality of the road system itself (Thomson, 1977). Improving public transport is actually of benefit to habitual motorists just as much as habitual public transport users, because every new user of public transport is one more traveller not adding to traffic congestion. And if motorists are persuaded to swap some of their car trips for public transport trips, so much the better. Of course, the ongoing provision of new road capacity on the predict-and-provide model drives the equilibrium in a mutually unsatisfactory direction: it attracts more private car trips on its own account, but also diverts funding from the maintenance and improvement of public transport, making it more likely that people will abandon public transport for car travel. This in turn deprives the public transport system of revenue, amplifying the vicious cycle. This is yet another reason why road plans on the predict-and-provide model, including all those produced in favour of the East West Link to date, constitute an outdated and counterproductive approach to urban transport provision. The equilibrium between use of private cars and use of public transport for passenger travel is also of critical importance to road freight transport. Trucks and vans are an important component of the urban transport task, but freight vehicles generally comprise just 10 per cent of the traffic on any given road. This means that the freight transport problem is really just the passenger transport problem in a new guise. It has been established that building the East West Link will add to traffic on suburban arterial roads: freight is thus likely to only be further impeded by private car traffic as a consequence. Freight transport is best aided by providing alternatives to private cars for passenger travel, so that additional congestion can be avoided. Australia, and the state of Victoria more specifically, has recently suffered a number of high-profile job losses. Australian industry is experiencing a painful transitional phase at present, and this generates much understandable anxiety about ongoing employment prospects for Australian workers, particularly those whose skills are linked to declining manufacturing industries. It is therefore understandable that politicians and union leaders will warm to the prospect of a road project that promises to create 3,200 jobs in construction within 12 months. Overlooked here, of course, is that spending an equivalent amount of money on any other construction project—or better, a diversified package of projects—would employ the same number of people. Indeed, it is widely argued that public transport infrastructure projects create more jobs per dollar spent, and those jobs include at least some that are long-lasting (such as the people who will operate the new services). The East West Link’s eastern stage involves $2.5 million of spending for every single job created, in a country where the median household income is $64,000. The best way to provide secure employment through infrastructure provision is with a continuous ‘pipeline’ of well-justified projects in service of a strategic objective. In the Australian transport sector for the past half-century, this meant a pipeline of road projects with steady funding provided virtually as-of-right, with the strategic objective of facilitating more travel by private car at the expense of alternatives. This succeeded in employing a substantial number of people in road engineering and construction. But having recognised the perverse consequences of the predict-and-provide model for road transport, the imperative now is to switch to the alternative: a pipeline of public transport improvements with a dedicated workforce of planners, engineers, construction workers, drivers, and service staff. There are, indeed, currently hundreds of workers gainfully employed in the construction of the Regional Rail Link project due for completion in 2015. As things stand, the only new jobs on offer for these workers after 2015 is on road projects where their valuable rail-specific experience is likely to atrophy. Rail projects are at least as labour-intensive as road projects and provide an alternative avenue for future employment. In short, there are alternatives to the East West Link that will employ more people with a more diverse range of skills for longer. It is appropriate that we turn now to consider these alternatives. As has been argued, debates about transport futures must always consider the inter-relationship between demand for private car travel and demand for travel by public or active transport, and between road freight and rail freight. The existence of the Downs equilibrium, attested by ample evidence, means that consideration of non-road alternatives to the East West Link cannot be dismissed out of hand, as road proponents have suggested, by stating that people in the road catchment “are not users of public transport”. One consequence of the East West Link being so costly at $16 billion is that it is likely to crowd out any alternative investment in transport infrastructure: as Mees said in his final public address, “there will be no money left for any substantial transport projects for Melbourne for at least a generation.” The East West Link therefore exists in direct competition with projects to strengthen and extend the rail network, but also with fixing rural roads and bridges, with providing adequate arterial road networks in the suburbs, and with grade-separating the hundreds of extant road-rail level crossings in Victoria. All such efforts are likely to face severe budget constraints as a consequence of the East West Link proceeding, just as similar efforts did when large sums were diverted to freeway-building in the latter part of the twentieth century. 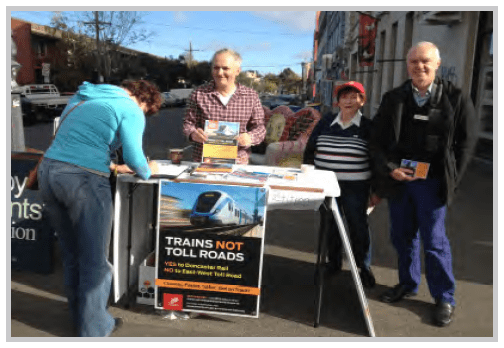 Figure 5: Local volunteers collect signatures for the City of Yarra’s Trains Not Tollroads campaign in 2013. The most relevant alternatives to the East West Link, however, must surely be those that tackle the same problems the East West Link purports to solve. In the popular debate surrounding the project, the two such alternatives most commonly mentioned are the Melbourne Metro tunnel and the Doncaster rail extension. The Melbourne Metro tunnel is put forward almost reflexively as the unique alternative to the East West Link in some quarters, particularly among politicians and commentators. This is likely due less to its specific benefits than to its rhetorical position in the framing of the Melbourne transport debate. The Metro tunnel and the East West Link shared top billing in the 2008 Eddington Report; both have budgets that are unprecedented in size for a single project; both have featured in Victorian Government submissions to Infrastructure Australia at various times; and both are at an advanced stage of planning. But even on the most cursory analysis, the Metro tunnel only tackles half the East West Link’s rationale: that for the western section. It provides substantial new capacity for travel in the west, and to a lesser extent in the south-east, but none to the east or north-east. It may rightly be called a West Gate Bridge alternative. But for travellers stuck in chronic traffic queues on the Eastern Freeway it is of virtually no relevance. The Doncaster rail extension is more closely targeted at the Eastern Freeway catchment in Melbourne’s north-eastern suburbs: specifically the City of Manningham, which has long held the distinction of being the only municipality in metropolitan Melbourne to lack any form of rail service. On Census day in 2011, just 12 per cent of Manningham workers travelled to work by public transport, compared to a metropolitan average of 18 per cent, and 20 per cent in the neighbouring City of Whitehorse that is a similar distance from central Melbourne but does have a train line. Conversely, 84 per cent of Manningham workers drove to work compared with 75 per cent in Whitehorse and 78 per cent in Melbourne as a whole. The Doncaster train line would run along the Eastern Freeway median for at least part of its length before proceeding underground to serve district centres in Manningham. Its potential to increase the mode share for public transport relative to that for car travel is argued by analogy with the Mandurah rail line in Perth, which also runs through low-density ‘freeway suburbs’. Prior to the train line opening in 2008, express bus services ran between Perth and Mandurah carrying 16,000 passengers a day. After 11 weeks of rail operation, the train line on the same route was carrying over 40,000 passengers a day (MacTiernan, 2008). According to statistics published by planning authority TransPerth, the train line now carries up to 75,000 passengers a day. 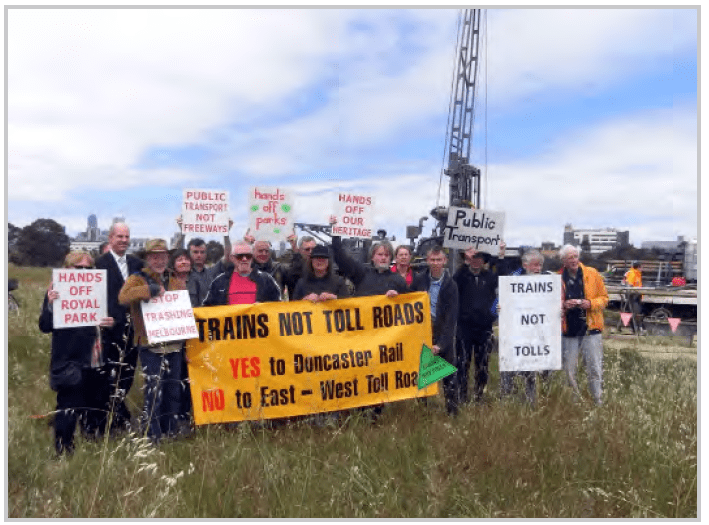 Critics of the Doncaster rail option point to two major challenges, however. The first is that where the railway runs in the freeway median its stations would be remote from the passenger catchment. This same issue occurs in Perth and in other cities, and its solution involves high-quality feeder bus networks, designed according to multimodal network planning principles of the sort described by Mees in his book Transport for Suburbia (Mees, 2010). 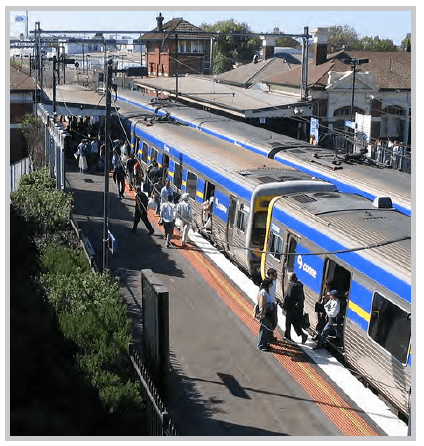 Case studies are cited in this and Mees’ earlier work A Very Public Solution (Mees, 2000) of cities where more than 70 per cent of suburban train passengers arrive at their station by connecting bus or tram. 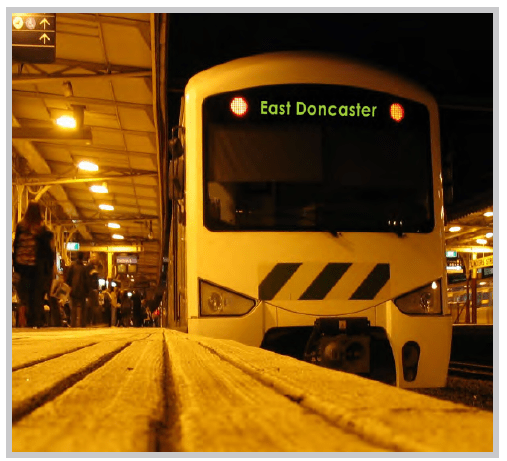 The Doncaster line’s second point of contention is that on the most affordable plan, Doncaster trains would share the same track as two existing train lines at the city end, as part of the so-called ‘Clifton Hill group’. Government planners have long argued that the infrastructure for this group lacks the capacity to carry trains on all three lines. At their busiest, the two existing lines account for a total of 18 trains per hour at present, and the practical capacity of the existing infrastructure (dependent primarily on signalling and station dwell times) is variously assessed as 22 to 24 trains per hour. So it is possible a Doncaster service with 6 trains per hour could be accommodated, but this would leave no room for future patronage growth at peak times. What this issue highlights is the fundamental importance of bringing Melbourne’s relatively outdated and neglected rail infrastructure up to the standard of comparable European cities. Since at least the turn of the century, European cities led by London and Paris have been systematically upgrading their rail signalling and train control systems to allow more trains to run on the same tracks. The state of the art currently is ‘radio based’ or ‘in-cab’ signalling, which locates signal aspects (the railway equivalent of traffic lights) in the driver’s cabin rather than on fixed trackside infrastructure. This is often combined with a ‘moving block’ signalling philosophy that allows trains to follow each other in a similar manner to cars on a freeway. These various ‘high capacity signalling’ solutions have boosted track capacity to between 30 and 33 trains per hour, compared with Melbourne’s 22 to 24 trains per hour (and less on suburban sections of the network). Achieving these sizeable gains in rail system capacity depends on a number of technical factors. It requires in particular that the network be close to fully ‘sectorised’ (so that trains do not cross each other’s path) and ideally fully grade-separated from the road network. Achieving this in Melbourne’s rail network, with its baroque operating practices and abundance of level crossings, will come at substantial cost. But the cost pales in comparison with that of building entire new rail corridors parallel to existing ones, or of providing the road capacity to accommodate the equivalent amount of car travel. Commentators have pointed to forecasts suggesting Melbourne is set to add another 1.3 million people in the next two decades, a number equivalent to the population of Adelaide or Munich. This suggests there is an imperative to expand the public transport network significantly within two decades simply to cater for population growth, even without the popular mandate to increase public transport’s mode share. Public transport advocates in Victoria led by the Public Transport Users Association have proposed a package of measures to revitalise Melbourne’s public transport. It involves a combination of high-capacity signalling, level crossing grade separation, suburban extensions (including to Melbourne Airport, a major source of such long-distance cross-city travel as does exist) and operational fixes for the rail network, along with an overhaul of suburban bus services, and minor works to improve train-tram and train-bus connections. It is drawn from measures that have succeeded in other cities from Paris to Zurich, and would likely have lasting benefits throughout the metropolitan area that the East West Link would not deliver. Yet all this could still be decades away if the East West Link proceeds. The East West Link is a massive backward step in Melbourne’s urban transport development, that belies a decade of strong forward momentum in developing public and active transport alternatives. Instead of responding to the evidence on the actual transport problems that demand a solution, and weighing the true benefits and costs against respectable alternative projects, the East West Link is a return to the discredited approach known as ‘predict and provide’. We now know from worldwide evidence that cities will wind up with as much traffic congestion as they are prepared to pay for in road capacity. By predicting hypothetical increases in traffic and providing new roads to cater for it, cities help bring about the very traffic congestion they forecast. Meanwhile, by monopolising transport budgets, the decisions to build roads deny funding to the public transport alternatives, particularly rail, that actually have a chance at creating the elusive ‘agglomeration benefits’ and allowing people to be productive in large cities without adding to traffic congestion. Colebatch, T. “CityLink deal might yet be an earner.” The Age, 13 June 2006. Davidson, K. “How to fund a better public transport system.” The Age, 28 October 2013. Druker, M. “The fundamental attribution error in transportation choice.” Psystenance, published online, . March 2010. Eddington, R. (2006) The Eddington Transport Study—The case for action: Sir Rod Eddington’s advice to Government. HM Treasury, 2006. Eddington, R. (2008) Investing in Transport: East West Link Needs Assessment. Victorian Government, March 2008. Glaeser, E. Triumph of the City. Pan Macmillan, 2012. Gordon, J. “East-west link would not return state costs.” The Age, 13 February 2014. Infrastructure Australia. (2011) Communicating the Imperative for Action: a report to the Council of Australian Governments. June 2011. Infrastructure Australia. (2013) National Infrastructure Plan. June 2013. Kahneman, D. Thinking, Fast and Slow. Penguin, 2011. Loader, C. “Car and transit use per capita in Australian cities.” Charting Transport, published online, . Originally posted January 2010, updated October 2013. MacTiernan, A. “Patronage figures soar on Perth-to-Mandurah railway.” WA Government media release, 11 March 2008. Mees, P. (2000) A Very Public Solution. Melbourne University Press, 2000. Mees, P. (2008a) “Does Melbourne need another central city rail tunnel?” Technical report, RMIT University, July 2008. Mees, P. (2008b) “Australia’s future infrastructure requirements: Avoiding wasteful expenditure in urban transport.” Submission to Infrastructure Australia, October 2008. Mees, P. (2010) Transport for Suburbia. Earthscan, 2010. Melbourne City Link Authority. “Life will certainly improve once we have a triple by-pass.” Advertisement, May 1995. Mencken, H. L. “The Divine Afflatus.” New York Evening Mail, 16 November 1917. Meyrick & Associates, Steer Davies Gleave & Econsearch. East West Needs Assessment: Economic Benefits and Costs Analysis: Technical Report. Technical report, March 2008. Murphy, J. “Vic project railroaded.” Australian Financial Review, 16 November 2011. Odgers, J. 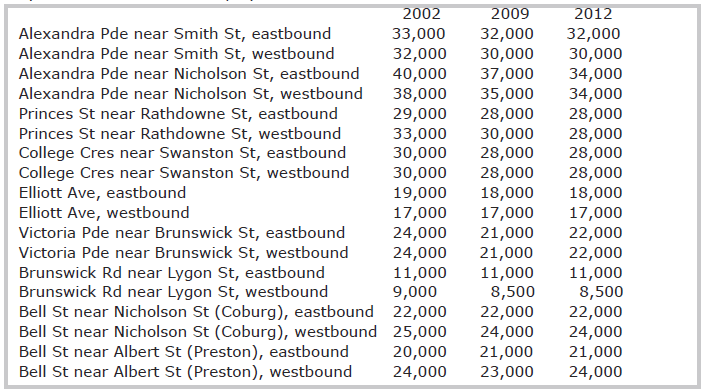 Have all the travel time savings on Melbourne’s road network been achieved? Technical report, RMIT School of Management, September 2009. PTUA (Public Transport Users Association). 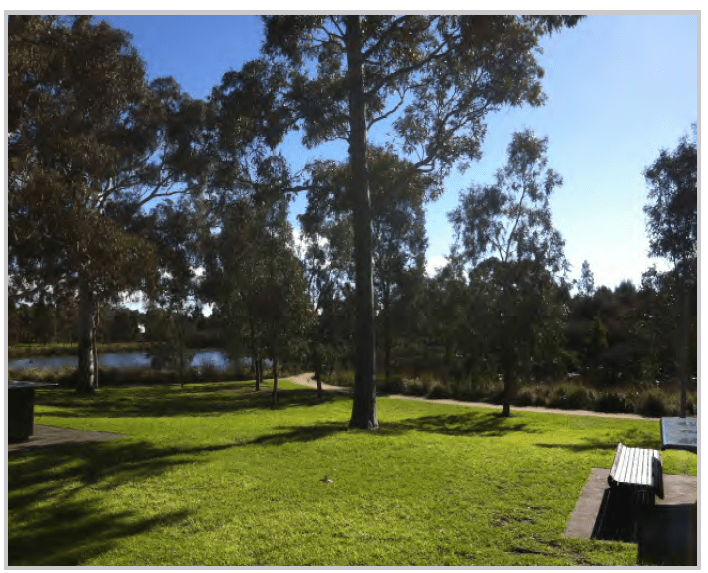 Scoresby Freeway Environment Effects Statement: Submission in Response. September 1998. Royal Commission on Environmental Pollution. Transport and the Environment. Oxford University Press, 1995. SACTRA (Standing Advisory Committee on Trunk Road Assessment). Trunk roads and the generation of traffic. Report for Department of Transport. HM Stationery Office, 1994. Stone, J. Political factors in the rebuilding of mass transit: an investigation of failure in Melbourne since 1970 through comparisons with Perth and Vancouver. PhD thesis, Swinburne University of Technology, Victoria, 2008. Thomson, J. M. Great Cities and Their Traffic. Gollancz, 1977. Tomazin, F. “Bandt says Greens can stop east-west link with balance of power.” The Age, 15 September 2013. Vicroads. Arterial Road Traffic Volumes. Online resource, Accessed February 2013. Victorian Government. (2002) Melbourne 2030: Planning for sustainable growth. October 2002. Victorian Government. (2008) The Victorian Transport Plan. December 2008. Well said Tony. There are so many reasons why the EWLink is such a bad idea. This is a really good summation. And thank you for the background to this issue too. Very Informative. Here’s to the success of the campaign to stop the “mad scheme”. If public transport is so efficient in Victoria – then why does it need a taxpayer subsidy to operate? And how many Victorians actually use public transport on a daily basis? @Ash – what market isn’t subsidised? – the public transport sector which is the governments’ responsibility to maintain and improve has neglected this at the expense of subsidising to increase road capacity which we don’t need anymore (roads already take up 25% of our land – we need to make productive use of it now, especially where new roads are just duplications). Hitherto I have seen no measurement in local streets of prevailing PM2.5 or any study of health in the likely affected population. This needs to be done to effectively measure likely local impacts of increased diesel PM2.5 truck traffic. Tony, calculating the difference on a BCR as Mees did is plain wrong, and you should cite only the IA figure. Benefits are calculated from a baseline, and a combination of projects that (theoretically) solves the same problem twice, won’t have the same total benefits as the addition of each individual project in isolation. To use a simple example, suppose I am hungry, and value sating that hunger at $4. You offer me either a pie+salad for $6, or a salad for $3. I value the taste of a pie at $1, and the taste of a salad at $2. The BCR of a pie+salad is (4+2+1)/6 or 1.16. Of just a salad: (4+2)/3 or 2. Of just a pie, it is (4+1)/3 or 1.67 (assuming no 2for1 specials was bringing the combined cost down). If you’d just calculated the difference as you do above you’d have come up with a BCR of 0.33. If you could accurately calculate the BCR using the difference, it would be because there was no overlap in benefits, in which case it is an apples and oranges comparison, as they solve (or try to solve) different issues. To some extent that is the case, because to the extent EWLink serves a purpose is as a freight bypass from Hastings to the airport and further north, while public transport is facilitating movement into the CBD. But the purported congestion benefits of both overlap. Similarly, static road volumes don’t tell you anything other than that the roads are at or near capacity (a decade from now static rail patronage on some lines will tell you the same thing). The case you need to be making is not that traffic is stalled, but that it is stalled because the limiting factor is not the capacity of those roads, but the points at which cars enter and exit those roads (particularly the CBD). And that, therefore, more efficient entry points are required (ie. public transport), not more capacity for forming queues. Nor does your conclusion in favour of Doncaster rail match the earlier claim that traffic “arises from the combined effect of many short-distance local trips”. If the problem is local trips then the solution should be improved walking, cycling and local public transport, all of which is much cheaper than a rail alternative. Andrews is now going to support the budget. It is obvious that he is in favour of the East West link after all. The Eastern freeway is full, going west in the evening. It is already stop-start at some times, in some places, which means that it is already running at less than full capacity (Freeways run lower capacity with slow traffic than they do with fast traffic). Any extra West-East traffic in the late afternoon will make the home journey slower for me and for thousands of other Eastern Freeway users. I understand that people queuing to exit the city end of the Eastern Freeway in the morning will be no worse off if they queue at the next point. But any additional West-East through traffic in the afternoon is going to choke the outgoing lanes.